Welcome to this weeks Kids in the Kitchen. It’s June already, time to start thinking of summer, although if today was anything to go by I think I’d rather not. We did have a nice sunny day over the weekend though and our tummies decided that ice cream would be a nice treat. 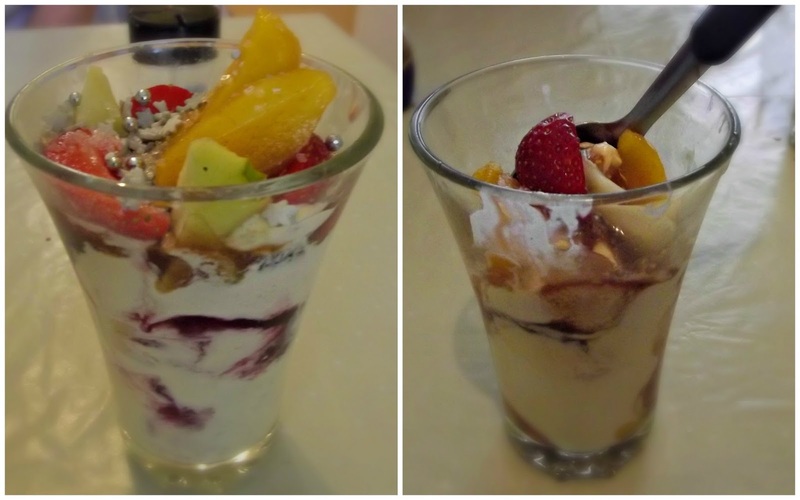 So for kids in the kitchen this week, we made Knickerbocker Glory. The new linky is open today and will stay open until the end of June. You can come and link up as often as you like throughout the month, come and share your recipes and kitchen escapades. There are no rules, just make your posts child friendly. I share posts on Pinterest where we have a fabulous board for inspiration. 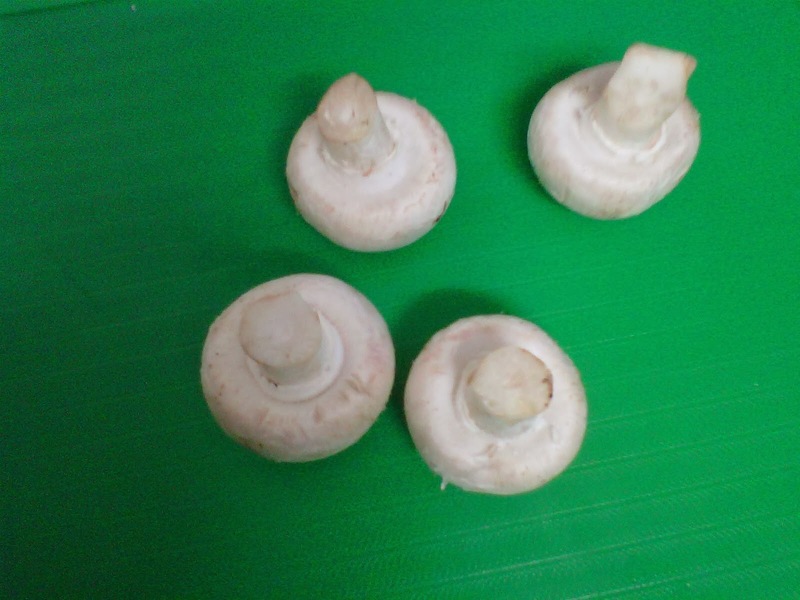 I also share on Twitter and give a little mention here on Kids in the Kitchen. 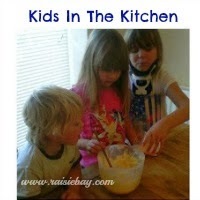 Follow Anne’s board Kids In The Kitchen on Pinterest. Boo asked us what a knickerbocker glory was and we told her it was a fruity ice cream served in a glass. She asked if she could make one, so how could we refuse? Kinckerbocker Glory is traditionally served in a tall glass with a long spoon and decorated with a wafer. The ingredients seem to vary, so long as you include ice-cream. We didn’t have the long spoons, and silly mummy forgot to get the wafers (but then they never actually get eaten anyway) but we did have lots of fun making our version of the desert. 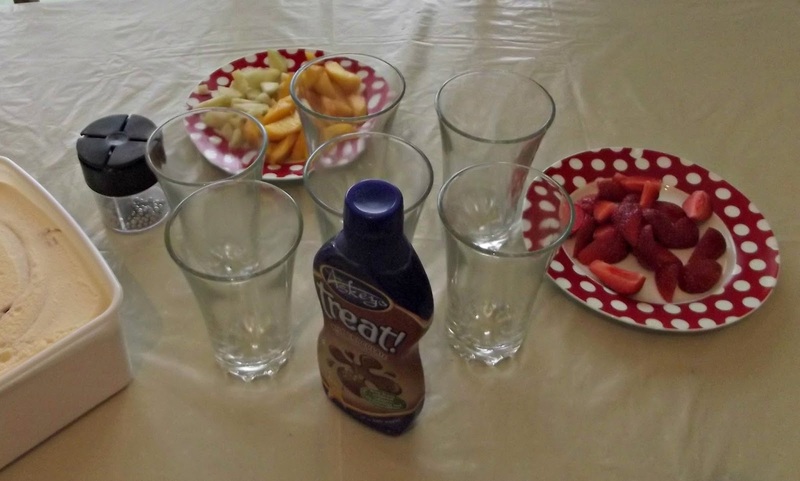 Then we each took a glass and layered the ingredients as we wished. 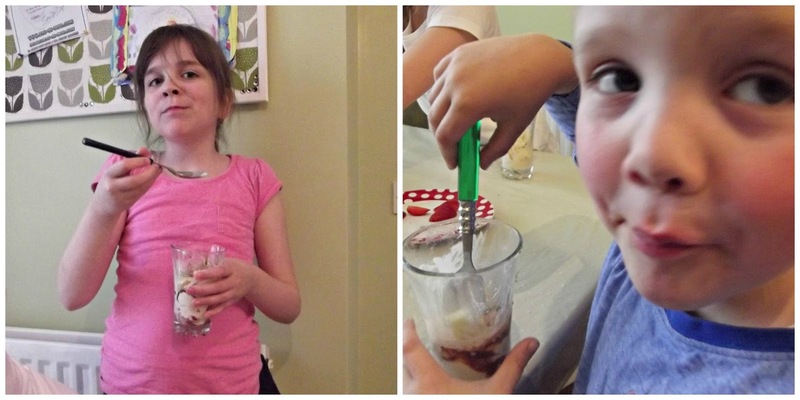 We had lots of fun making our knickerbocker glories. We also had lots of fun eating them. And at least one of your five a day! When I was little the kitchen was the hub of our home. It’s where everyone congregated to chat and drink tea and put the world to rights. The front room was for guests and was always kept neat and tidy. The kitchen was were all the action was and the kettle was always boiling. My wish now is to make my kitchen more homely. I want people to feel welcome and comfortable in there if they’ve popped in for a visit and chat. I want the kids to feel happy playing around the table, just like we used to. Play board games, or colouring in books or even doing homework. I don’t want to be stuck in the kitchen alone while I cook meals and bake all day, I’d love some company. First step is to give the kitchen a makeover. It’s not bad at the moment, but it’s a little drab. It needs a little more colour and maybe some decoration. I’m thinking a lick of paint. Maybe a nice welcoming green or warm yellow and some pictures on the wall. I have some lovely art work that the children have done that I’m thinking of having framed. One step further than drawings on fridge. A nice colourful clock and maybe some plants, perhaps even my home grown herbs. Storage is important. It’s nice to keep the work surfaces free from clutter. I have lots of cupboards for storing things away but it would be nice to leave some things on show, or to hand. A nice fruit bowl always looks lovely and a spice rack that fits in with the decor, I hate having to rummage through the cupboard for my spices and you can get some really nice spice racks that look lovely on display. The dining area is going to be one of the most important areas if you want people to spend more time in the kitchen. You can find dining tables to fit most spaces, and extending tables are great for when you have extra guests but don’t want to take up so much room all the time. I also believe in a selection of table clothes, in particular a few throw away ones for children’s messy activities. My daughter Boo already loves laying the table for dinner like I used to do for my mom when I was little. My kids already love being in the kitchen helping me cook, each week we are cooking up a storm and I try to record as much as possible for my Kids in the Kitchen feature. They are also in there enjoying crafts around the kitchen table, it’s a lovely big space they can all work together and the mess is so much easier to clean up. I can’t wait to get started on making my kitchen more appealing. I love it in there already, but that’s because I’m always cooking. Now I’m looking forward to having some company because I know my grandma never spent a minute alone in her kitchen. So if you pop around you’ll be sure of a warm welcome and a nice cuppa with a biscuit or two, or maybe even a slice of cake! Thank you to Tesco for help in bringing you this post. 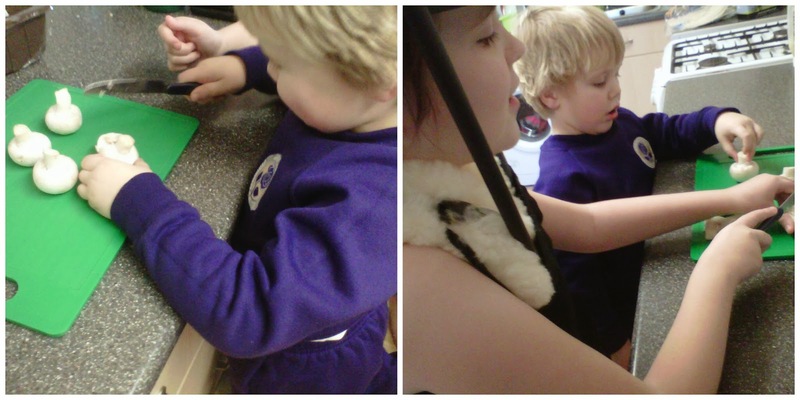 Welcome back to kids in the kitchen, this is my second week of the linky. 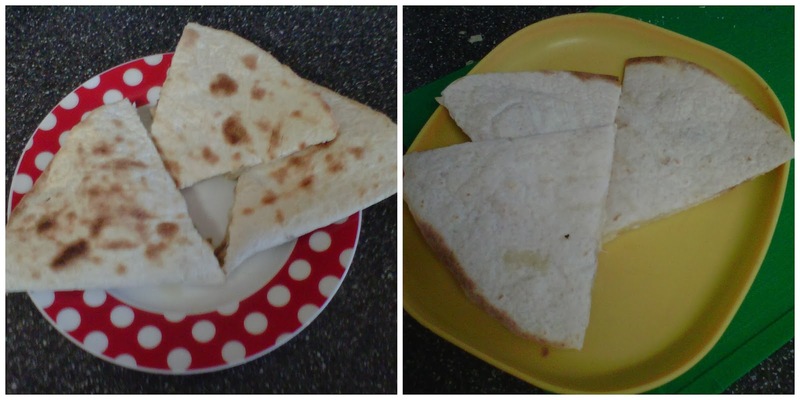 This week my littlies made quesadillas for lunch, more about that in a minute but first up, if you don’t know anything about Kids In The Kitchen please check out the main page. I really hope you can join in. The rules for this linky are simple…get your kids in the kitchen and post about it, then link up! 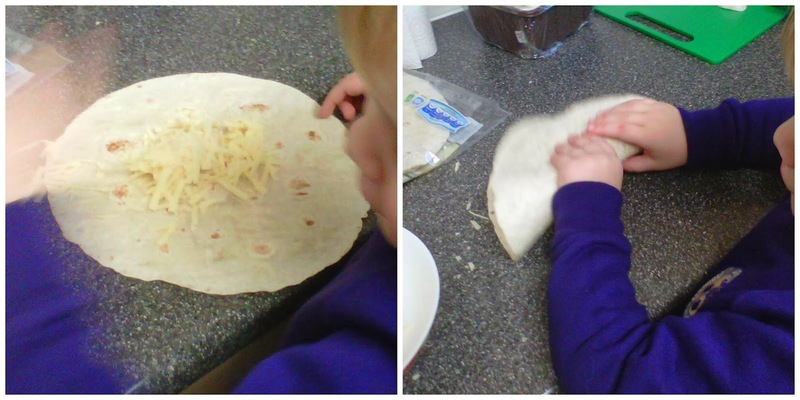 As I said, my littlies made quesadillas for their lunch. We started with something quick and simple, always the best way to start if you ask me. 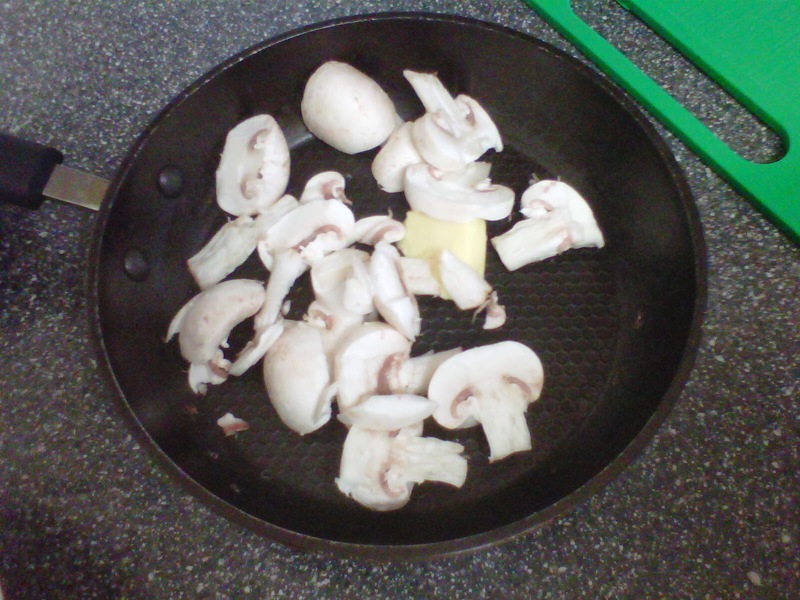 Then we took our wraps and filled them with the mushrooms and some cheese that mummy had grated for us. Then we folded the wraps. Mummy cooked the wraps under the grill until they were warm and toasty. Then we ate them, yum yum! Now it’s your turn. Join my linky and show everyone what your kids have been cooking this week. I would love you to display my badge to help spread the word.